Mumbai, March 25: Pace spearhead Jasprit Bumrah has "recovered well" after hurting his left shoulder during the IPL match against Delhi Capitals here Sunday, Mumbai Indians' team management said. 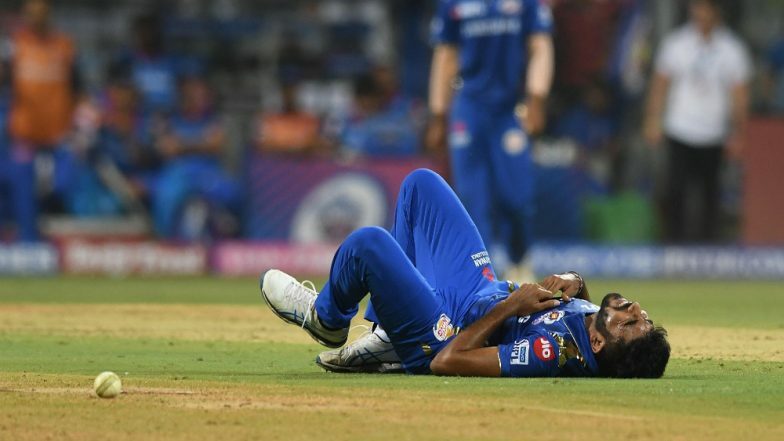 Bumrah suffered the injury when he fell while bowling the team's final over, needing the help of Mumbai Indians physiotherapist Nitin Patel to laboriously walk back to the dugout, a development that kept the World Cup-bound Indian team on tenterhooks. VIVO IPL 2019: Delhi Capital's All-Round Performance Helps Beat Mumbai Indians by 37 Runs at Wankhede Stadium. Having been at the receiving end of Rishabh Pant's brutal onslaught, Bumrah, soon after bowling a yorker, was seen clutching his left-shoulder area after he dived to save the ball on the final delivery of Delhi Capitals innings. Pant managed to dig the ball back to Bumrah, who dived to his left in his follow-through to stop it. Bumrah is an important cog in the wheel for the Indian team heading to the United Kingdom in two months' time. The Mumbai Indians physio came out and trudged him off the field even as the pace spearhead seemed to be in pain.